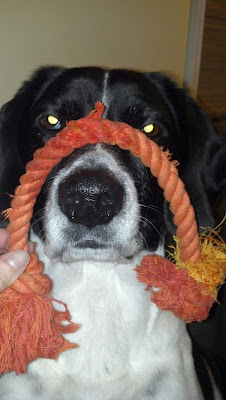 Sometimes a fun night is torturing the dog! No animals were hurt here. Although she didn't like it, Regina got a treat in the end and was happy. I have always LOVED that my kids consider their true best friends to be my friends kids. So excited that the Hardings came for dinner. Rich talked about how they all liked Oreos from the first second he knew Maddie was coming. 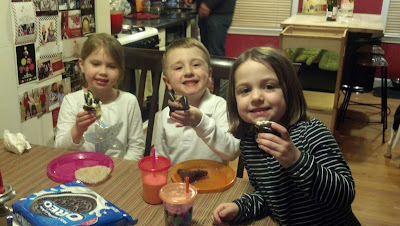 SO they asked for not only a cupcake, but an Oreo to put in their cupcake! 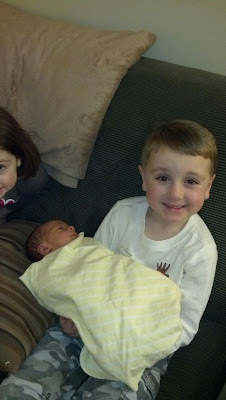 Had another great visit with new cousin Bradley. Erin and Matt already seem like pros! 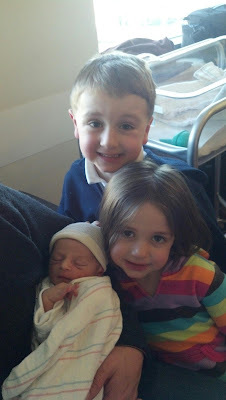 The kids were so excited to get to hold the baby. Bradley was mostly excited, when he wasn't hungry. Can't blame them. I could hold that baby all day as well. 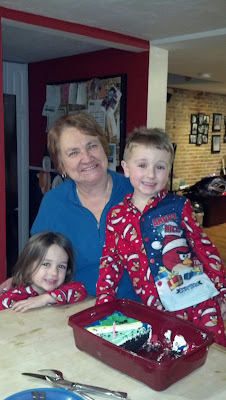 Since Babci couldn't be here for Rich's birthday we just celebrated again when she got here. 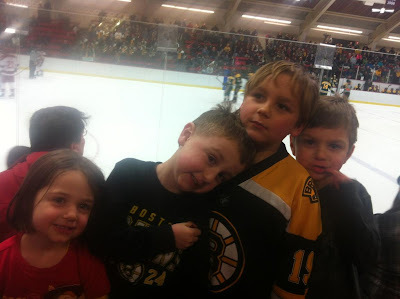 Took the kids to the Clarkson hockey game at Harvard. They love college hockey. Still funny seeing the pep band and how crazy the kids get cheering and dancing. I guess the game was televised and we made it on TV a lot. He has quite a large fan base already as you can tell from these pictures! I can't believe my baby is 6. He is psyched about it. He said he had the best day. At school he got a crown where he drew all of his favorite things (a cat???) and was line leader all day. Also every kid wrote a compliment that was put into a jar. They are amazingly sweet and really reflect who he is. He has 6 best friends and 2 girls who think he is cute. Utoh! Corn muffins for breakfast and buffalo chicken nachos for dinner. Who wouldn't pick that?!? Happy birthday to my baby boy! We love your huge warm heart and the passion you put into everything you do. This world is lucky to have you in it. You will do amazing things! Big weekend of playoff football games! 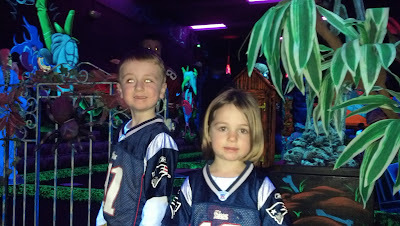 The kids were all ready in their Patriots gear. Aunt Erin and Uncle Matt came to watch as well. We made some spicy wings and nachos to try to rise that baby but it didn't work. 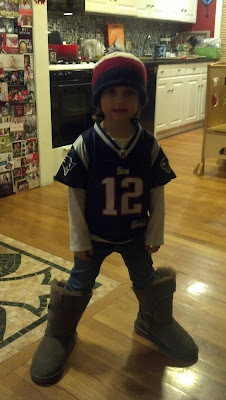 Love my little Tom Brady in her UGGS just like Tom! And of course Rich got more birthday presents. 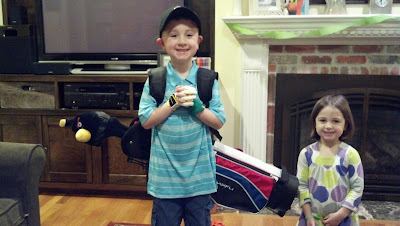 A fun afternoon of indoor glow in the dark mini golf! A little scary, but worth it! Then a huge burgers and ice cream lunch with best bud Colton. There are some days you just can't ask for more. When you are little your birthday lasts days!! A whole weekend with cousins too. 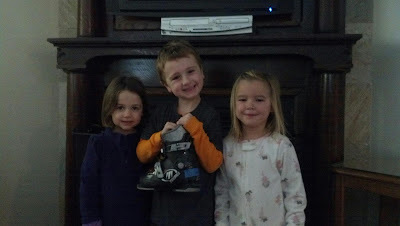 They went to his hockey practice, his party, helped him open his presents, had a dance party and more. Then we topped it off with a big Bruins/Rangers rivalry opening night game. The kids don't know it, but Jim and Chris actually went to the Garden and snuck in after the second period! Not sure I want them to know these are the things Dads do when you go to bed. 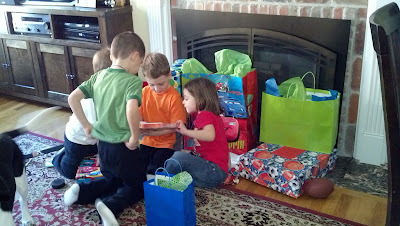 Richard was lucky enough to have the BEST 6th birthday party with family and friends. 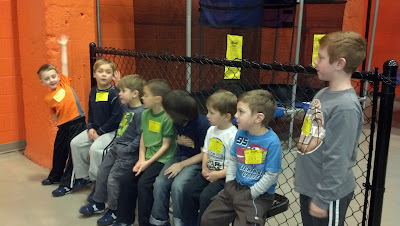 Sky Zone is a trampoline park and the kids had a blast. Even Chris and Jim got in on the fun! Beautiful walk to school today! So excited to have hockey back! 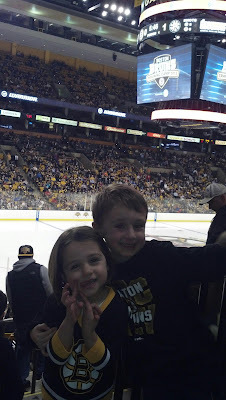 Tonight we went to a free scrimmage between the Providence Bruins and the Boston Bruins! You can see Ang cheered up once she got Twizzlers! Just got back from an amazing family ski vacation at Smugglers Notch, VT. 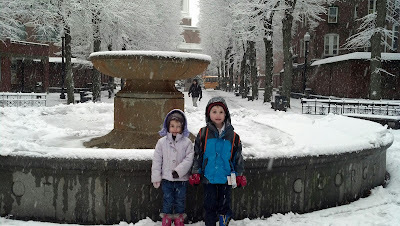 So excited that the kids love to be together and exercise outside in the winter. And Ang is already an excellent ski bunny. Actually more like a kamikaze! We also went with our friends the Larsons. Always better to have kids to play with. Haley and Rich were in the same ski class and would snuggle on the couch at night.